If the ascent of Atletico Madrid to the status of genuine title challengers in La Liga over the last 5 years has been a feel good story then the fall of Valencia over the same time frame has been something of a surprise to those that remember the great Valencia teams who reached the latter stages of European competition on a near consistent basis. Indeed the side from the East of Spain have almost become synonymous with bad management both on the field and in the boardroom over the last half century as coach after coach has been hired in an attempt to right the ship at the Mestalla and have then challenging once again at the summit of La Liga. So far though and despite the increased investment from Peter Lim and the influence of super agent Jorge Mendes Los Che have struggled to make any significant progress. This season however seems to have a distinctly different feel to it. The appointment in the summer of Marcelino as head coach feels like the turning point for this famous club, the former La Liga star has been slowly and steadily building an impressive coaching CV with his last two terms at Sevilla and then Villarreal proving that he is ready for a challenge amongst the elite of Spanish football. Their opponents in this match Sevilla on the other hand very much have the feel of a team in transition with the dramatic departure of Jorge Sampaoli after only one season and the resulting appointment of the former Celta Vigo coach Eduardo Berizzo. Whilst there is no doubt that Berizzo very much has the ability to coach at this level there has so far been a sense that he is yet to make this Sevilla side his own leading to some very disjointed performances. There were no surprises with the home side as they lined up in a fairly orthodox 4-4-2 shape although the positioning of Carlos Soler on the right hand side of midfield, Soler is naturally a central midfielder, there was a narrow feel to the system down that side. The Brazilian Neto started in goal behind a back four of Martin Montoya, Gabriel Paulista, Jeison Murillo and Jose Gaya. In the midfield Goncalo Guedes started on the left with academy product Carlos Soler on the right while Dani Parejo and Geoffrey Kondogbia played centrally. Rodrigo and Simone Zaza played as the two strikers although the Spanish international Rodrigo was more mobile and withdrawn from the front line for periods of the match. Sevilla played a variant of 4-1-4-1 with the wide midfielders in particular being expected to support the lone striker in the attacking phase. Sergio Rico started in goal behind Gabriel Mercado, Simon Kjaer, Clement Lenglet and Sergio Escudero. The sitting midfielder was Guido Pizzaro whilst ahead of him Jesus Navas and Nolito occupied the wide areas with Ever Banega and Francesco Vazquez playing centrally. The Colombian international Luis Muriel was the lone striker for the away side. 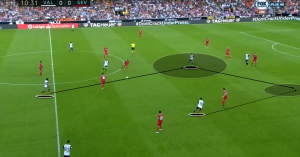 With Valencia playing from a fairly standard 4-4-2 base there were connections all across the field that enabled Valencia to progress the ball towards the Sevilla goal whilst maintaining possession. 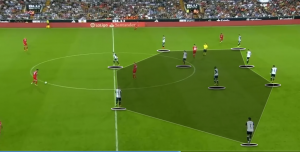 There was enough movement from the starting lines of the midfielders and strikers to ensure that Valencia were rarely playing in just three distinct lines in the attacking phase and the supporting movements from the fullbacks ensured that even when Guedes and Soler moved inside the width was maintained. In this example we see Geoffrey Kondogbia advancing in to the Sevilla half of the field. Martin Montoya has advanced to the same line as the ball on the near side but the rest of the midfield is positioned in more advanced positions ahead of the ball. With Simone Zaza maintaining a high position in the field and pinning the Sevilla defensive line back we see his strike partner Rodrigo drop off on to the space between the Sevilla defence and midfield. This movement allows Kondogbia to play the vertical pass in to space, thus cutting out the midfield line of pressure from Sevilla. This pass is also a sign for Soler on the right to make a run beyond his marker to pick up the first time pass from the forward. This is the interplay that led to the second Valencia goal. With Rodrigo in possession of the ball at the corner of the Sevilla penalty area. The opposition defensive line are compact and positioned across the edge of the penalty area. The position of the supporting player in a pocket of space outside the penalty area is key here. The defenders are unwilling to collapse back towards their own goal given the threat of the pull back. This means that Zaza is able to time a run in between the defenders in to the penalty area. The ball is then slipped through the defensive line by Rodrigo and Zaza goes on to finish confidently across the goalkeeper and in to the corner of the goal. With the movement created and used by Valencia as they moved the ball through the thirds of the field we saw the home side create opportunities to overload the opposition time and time again in different parts of the field. By being fluid with their movement around the ball it became very difficult for Sevilla to implement effective defensive structures to prevent the home side from breaking through. Both wide midfielders in particular were key with their movements with both Guedes and Soler being extremely comfortable moving not only in to the half spaces but also on the central areas of the field to combine with team mates. Here we see Guedes in possession as he moves diagonally from the wide area in to the half space in the final third. The width is maintained by Jose Gaya who has advanced forward from the left back position. Rodrigo is the nearest forward to the ball and his diagonal movement creates the opportunity of an overload on the far corner of the box should Guedes choose to use it. The movement from Rodrigo however is also key as it takes the attention of the defensive block from Sevilla. That creates an opportunity for Parejo to advance from a deep central area to essentially isolate the deepest defender in at the edge of the penalty area. This time we see Valencia create an opportunity to overload on the side of the field furthest from the position of the goal. The ball is on the left hand side as Soler and Montoya move in to advanced positions to get on the ball. As the ball is switched from left to right the covering defender is immediately isolated as he has to choose between engaging the ball or covering the run towards his blind side. Marcelino is perhaps best known as a coach who is defensively orientated and who looks to work closely with his defensive players in order to clearly define the defensive phase of his model of play before going on to explain how they will look to attack. His work to this point with Valencia very much follows that pattern and they are becoming recognised as one of the most efficient defensive outfits in La Liga. Sevilla struggled to gain any traction in the final third of the field throughout this match as Valencia worked to deny them any passing lanes. This shows the defensive structure from Valencia in effect. They play in a medium block with pressing initiated as the opposition progress the ball through the middle third of the pitch. Zaza and Rodrigo will engage the ball carrier but their primary focus was on preventing Sevilla from playing through the centre of the field and blocking passing lanes. The defensive line stays closely connected to the midfield block to deny spaces between the lines for the opposition to play in. Here again we can see the compact nature of the midfield line for Valencia as they deny Sevilla the space to play through. Sevilla have to players in the wide area that can be accessed relatively easily. Valencia were happy to cede the wide spaces to their opponent as with the ball circulation from Sevilla remaining relatively slow Valencia were able to shift the orientation of their defensive block over to negate the threat. Valencia have very much became one of the most attractive teams in European football. Their combination of defensive solidarity and attacking balance is excellent and in this match Sevilla never appeared to get to grips with the attacking threat of the home side or pose much of a risk to the Valcncia goal. With no European football to distract them from the domestic campaign we could well see Valencia challenge for the top three in La Liga this season, especially with Atletico Madrid struggling for form. If Valencia do begin to challenge consistently towards the top of the table and qualify for Europe then we should see the stock of Marcelino continue to rise and rise.